I recently contracted Four Oaks Bakery to make some cupcakes and cookies for my daughter’s baby shower. She had a dragonfly theme. I really wanted something special to stand out next to all of the other desserts. Emily nailed it. 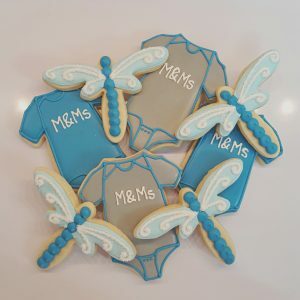 She made the most beautifully decorated to perfection dragonfly and onesie cookies. 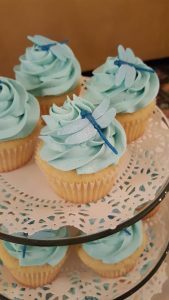 The cupcakes had an edible dragonfly on top. I was just elated when I saw the finished products. To top it off–they were delicious, too!